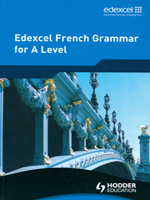 358 Pages, Illustrated, 6 1/8 x 9 1/8"
Edexcel French Grammar for A Level is the comprehensive grammar reference textbook of choice for students studying for A level. Edexcel French Grammar for A Level takes a contemporary approach to language and gives plenty of practice with graded reinforcement exercises. Our contents list maps the latest Edexcel GCE A Level specification, highlighting the language and grammatical structures you need for the AS and A2 exam. • Mécanismes provides clear explanations in English with examples in French. • Mettez-vous au point! Includes graded reinforcement exercises to practice what has been explained, with a self-check answer key. • ... Et en route! offers a range of open-ended communicative activities to encourage and develop the creative use of language using the grammar points covered. 48 Some hints to develop your French vocabulary, whilst avoiding the traps!